If the network has a DHCP server, the computer will obtain an IP address automatically. 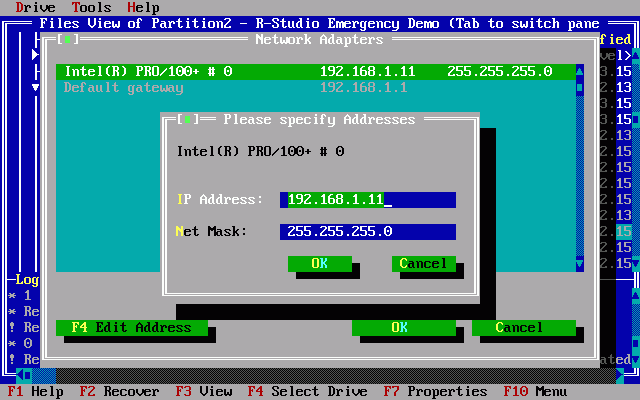 A list of adapters and their IP addresses will appear on the Network Adapters dialog box. If the network does not have a DHCP server, select a network adapter on the Network Adapters dialog box and press the F4 key. Enter the IP address and network mask and press the Enter button. IP address of the computer where the network drive is to reside. Name of the shared folder where the network drive is to reside. Username of a user on the computer where the network drive is to reside. User's password on the computer where the network drive is to reside. Server share name : Net_Drive .